Whacko Yard Art: Stickin’ It To The Man Edition. 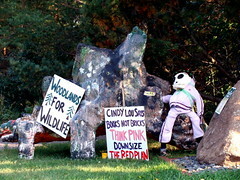 Now, I don’t know if this counts, because I took these pictures back in September and I don’t know if it’s still standing (it looks like parts of it were made out of papier-mÃ¢ché, so I’m not sure how it would’ve fared through the winter months), but it was definitely in a yard and it was definitely art. And yeah, definitely a little whacko, too. The race is on, and we have a leader! Hey there. Off-topic, but if there are any regular commenters here, you are invited to be guest commenters on MNspeak, aka Secrets of the City or SOTC, on the Friday Open thread. I read this Duluth blog irregularly, but when I do, I think there are some kindred spirits. Or you could just visit and lurk (nicely). As soon as Paul posted this contest, that guy was the first one that popped into my head. I just hope I'm never so pissed about something that I would build something like this in my yard. 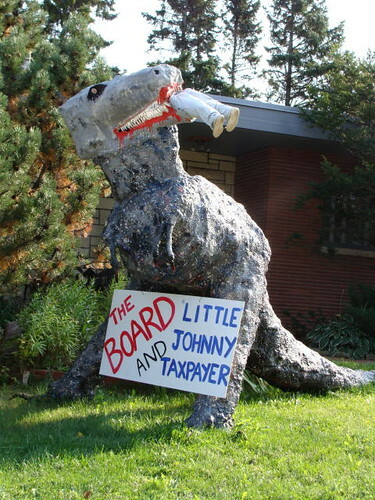 Or post an insane diatribe on a handmade billboard like that guy on hwy 53 by Cotton. But I'm still relatively young and easily peeved, so perhaps there's hope for me yet. Whacko Yard Art: Here Comes Santa Claus Edition.